Many teenagers count the days until they can get behind the wheel of the family car and cruise. Many of their parents count the days, too, but for entirely different reasons. For the teens, it means freedom and fun. For their parents, it means sleepless nights and lighter wallets. The parents’ concerns are valid. Drivers under 25 are four times as likely as older drivers to die in an accident, reports the National Highway Traffic Safety Administration. As a result, adding a 16-year-old driver to your auto insurance policy can come with a hefty price tag. Premium increases of 50 to 100 percent are not unheard of, says Loretta Worters, spokeswoman with the New York-based trade group Insurance Information Institute. Fortunately, you can take steps to rein in premium increases. Comparison shop for teen-driver prices, says Lewis Mandell, professor of finance at the University of Buffalo in Buffalo, N.Y. While rates for 40-somethings may be fairly standard among insurers, that’s not always the case. Consider a higher deductible. Going from a $500 to a $1,000 deductible can save you 10 percent to 20 percent on your premium, says Madelyn Flannagan, vice president of education and research for the Independent Insurance Agents and Brokers of America, an Alexandria, Va.-based professional association. You’ll want to weigh whether you can absorb the out-of-pocket expense in the event of an accident. You’ll also want to evaluate taking out a separate policy for your teen. Assuming you and your spouse have a good claims record, you’re probably best off simply adding your teen driver to your own policy and paying the increased premium, says Robert Klein, director of the Center for Risk Management and Insurance Research at Georgia State University in Atlanta. On the other hand, if your driving record leaves a lot to be desired or you drive expensive cars, it may be less expensive to get your teen a separate policy. Down the road, you’ll want to check just when your insurer classifies young drivers as adults. At that point, you should see a decrease in your rates, says Gwen Reichbach, director of the National Institute for Consumer Education at Eastern Michigan University. If you’re planning to purchase another car, think carefully about your choices. While your son or daughter may be begging for a new sports car, a safe and stodgy used car will be easier on your insurance rates. It’s less likely to be stolen, and probably will do better in a crash test. Your premiums should reflect these differences. Should you get a car, it probably will make sense to keep it in your name, says Mandell. “Typically, parents have more assets, so they take greater responsibility,” he says. Thus, insurers are likely to charge a lower premium. 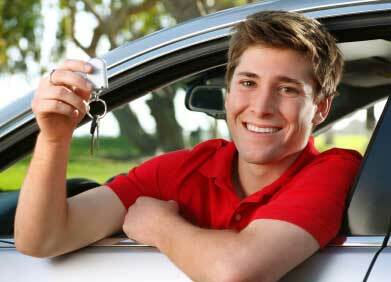 Whether or not you buy another car, you can ask your insurer to assign your teen driver to just one of your cars. In other words, the insurer would calculate your premium under the assumption that your teenager only drives a specific car, typically a less expensive one. Be warned, however: Many insurers will not assign certain cars to certain drivers; they assume anyone in the house can drive any of the cars. And, according to the Independent Insurance Agents and Brokers of America, you can expect that the insurance company will also price the premium based on the highest risk vehicle on your policy. If your insurance carrier agrees to assign your teen to a specific car, you need to lay down the law. Your new driver should take only the car to which he or she is assigned, even in an emergency. If your teen drives another car and gets in an accident, your rates likely will get a hefty boost. Your insurer could even impose a penalty or decide not to renew your policy. Let your insurance company know if your child has a B or better grade average. Studies have shown a correlation between good students and responsible drivers, so many insurers offer good-student discounts, which typically range from 5 percent to 10 percent, says Flannagan. It also helps to have your child take a driver’s education course, rather than try to teach him or her the rules of the road yourself. Such courses can be good for discounts of up to 15 percent, says Worters. Just make sure the course you have in mind is approved by your insurer. In addition, some insurers offer “safe driver programs.” Teen participants in these programs sign contracts stating that they won’t, for instance, drink and drive. Check with your insurance company. If your teenager completes the program, you may be able to cut another 5 percent or so from your increase. More states have now enacted what are known as “graduated licenses.” New drivers are restricted from certain activities, such as driving with passengers, until they’ve had their licenses for a set period, such as six months. If you live in one of these states, ask if any discounts are available. Some insurers may take a few percentage points off your increase. Finally, you may be eligible for lower premiums once your teen heads to college. Many insurers will reduce rates for students attending a school at least 100 miles away from home and who don’t have a car on campus, says Worters of the Insurance Information Institute. As you’re checking out insurance for your teen driver, you’ll want to avoid these mistakes. First, don’t procrastinate. As soon as your teenager is ready to get a permit, let your insurance company know. If you forget and your child is involved in an accident, your insurance company generally will cover it, says Worters. However, it can retroactively charge the higher premium that you should have been paying. In an extreme case, it could revoke your coverage. You also don’t want to drastically lower your liability coverage in order to reduce your rate increase, says Klein. Granted, doing so may save a few dollars now. However, it doesn’t make sense to carry less coverage on a higher-risk driver. Should your teenager get into an accident, you’ll be forced to cover the damages from your own pocket. Ultimately, helping your son or daughter establish a good driving record will be your best protection against sky-high insurance rates. Of course, the primary objective of driving safely is to prevent injuries and fatalities. However, traffic violations and accidents also directly affect your pocketbook. If your teenager’s drinking or recklessness results in an accident, your premiums can jump by several hundred percent. The longer your teenager motors along without an accident or traffic violation, the more you’ll be able to negotiate lower premiums. More importantly, you’ll know that your son or daughter is less likely to be involved in an accident. >> Contact Kerrigan, O’Malley & Bailey Insurance Agency for specifics of Massachusetts auto insurance for your teenager. Pools and spas can be lots of fun. But they can also be very dangerous, especially to children. The Home Safety Council encourages families to follow the safety steps below to avoid injuries in and around pools and spas. When children are in or near the water, a grownup should watch them very carefully. Do not take your eyes off them. Older children should not be left in charge of younger children in the pool area. If you have a pool or spa, install a fence that goes all the way around it. The fence should close and latch by itself. It should be least five feet high. Always keep gates closed and latched. Never prop a gate open. Do not leave furniture near the fence that would enable a child to climb over it. Keep the pool area clear of things you could trip on. Keep a cordless, water resistant telephone with emergency numbers posted in the pool area. Keep poolside rescue equipment close by. Equipment should include a rescue pole measuring at least 10-12 feet and a ring buoy with line. Do not allow children to play with these tools. Keep a life vest approved by the U.S. Coast Guard on hand. Anyone who is not a good swimmer should wear a vest. For extra safety, use a pool alarm to alert you if someone falls into the pool. Recent studies show that sub surface pool alarms are most effective. These alarms are not substitutes for adult supervision of children. Keep spas and hot tubs covered and locked when not in use. Remove excess water from pool and spa covers. Completely remove pool and spa covers before anyone gets in. Chlorine-based pool care products can explode and catch on fire. Always follow manufacturer’s instructions when using pool chemicals and store chemicals in a dry place away from heat sources. Lock all pool chemicals in a secure cabinet out of children’s reach. Also remember to mention you have a pool when getting a Massachusetts Homeowners Insurance Policy, as any accident involving your pool may not be covered if it has been omitted from the policy. You are currently browsing the Koinsurance's Blog blog archives for June, 2010.